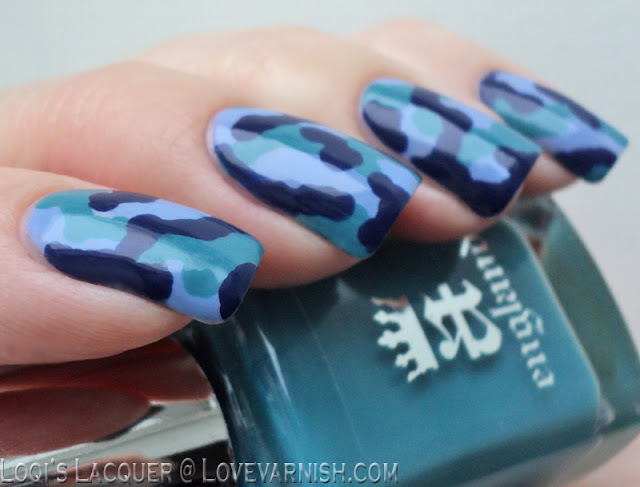 Love Varnish: 31 Day Nail Art Challenge - Blue Nails! Hi loves! Woah, day 5 for the 31 Day Nail Art Challenge already, we are doing great don't you think :)? Today I got a manicure that I slightly copied from Marta from Chit Chat Nails. 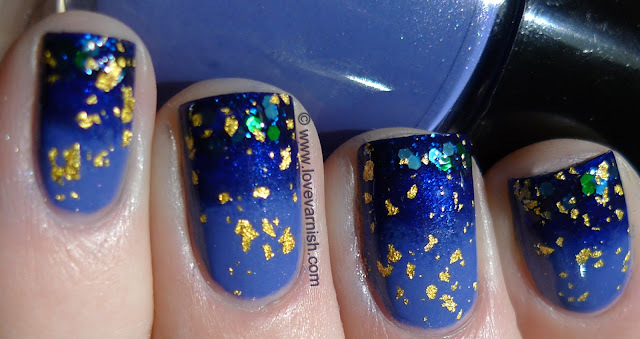 She once did a gorgeous blue gradient that also contained glitter and a gold flake topcoat. When I was wrecking my brain yesterday for inspiration (I wanted to prepare last Sunday but totally forgot when doing all those Catrice swatches) I remembered this gorgeous manicure she did, and decided to recreate! I didn't have the polishes she used though so, I picked the following: Catrice Denim Moore for the light base (yeah... totally got 3 more Catrice polishes...), Essence Deep Blue Sea for the tips, Essence Blue Addicted for the glitter on the tips and my own homemade 24k gold topcoat! I really liked the endresult and though it isn't exactly the same as Marta's manicure, I do like the outcome of my little "copy" adventure! 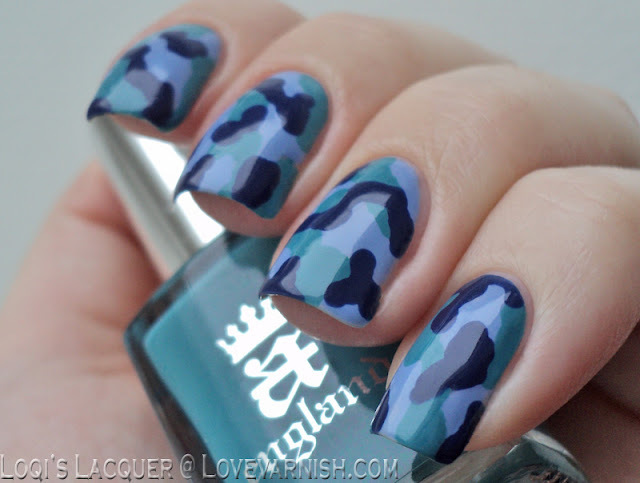 A very long while ago I did this camo manicure. It was a theme manicure going with an outfit, but I really loved the look of it. So I have decided to recreate it, not with green but with blue. To create this manicure I put 3 blue polishes on a piece of paper and using a dotting tool, made small irregular shapes on the nail. (You could paint your nails one of the blues as a base first and then put the 2 others over it, but this was much faster). The polishes I used were: Kiko 339 (lightest blue) A-england Galahad (medium blue) and Herome Frankfurt (dark blue). When that was done I put a nice coat of topcoat over it to smooth it out, and done! Fashion camo! Stay tuned for challenge day 6: violet! 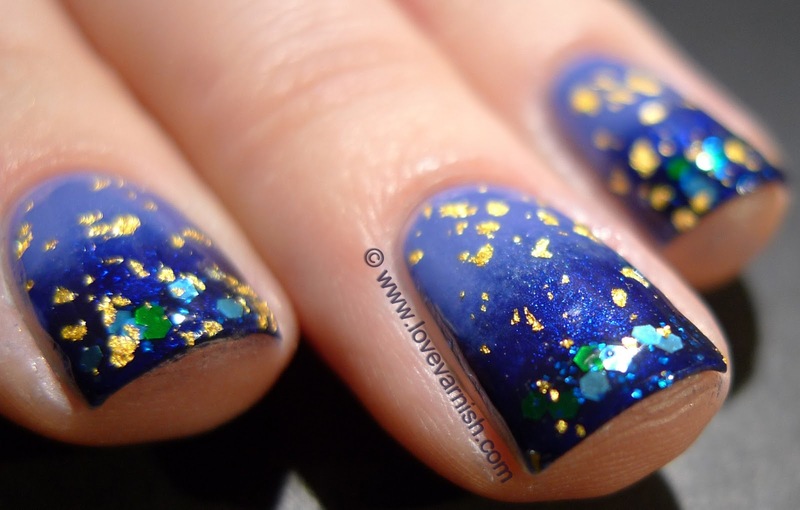 Wow, how did you manage to make your own gold topcoat? LOOOVE both manicures! 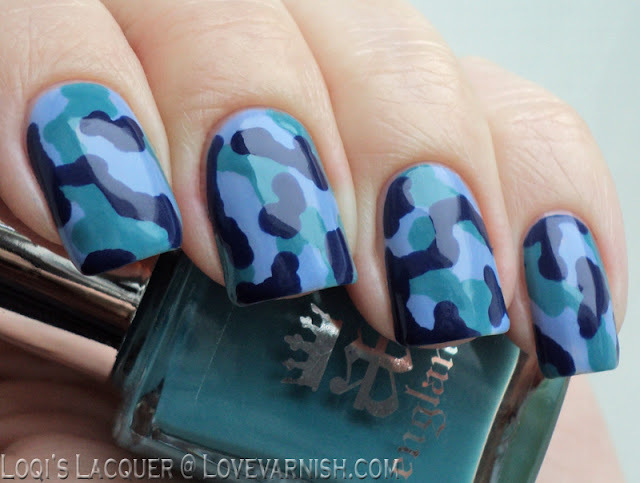 I have to try such a blue gradient, it's beautiful! Oh Wow! Both manis are gorgeous!!! 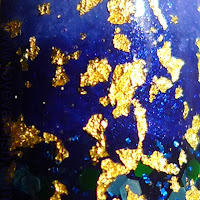 There is a post about it here: http://www.lovevarnish.com/2012/12/how-to-make-your-own-24k-gold-topcoat.html :). Thanks Karine! 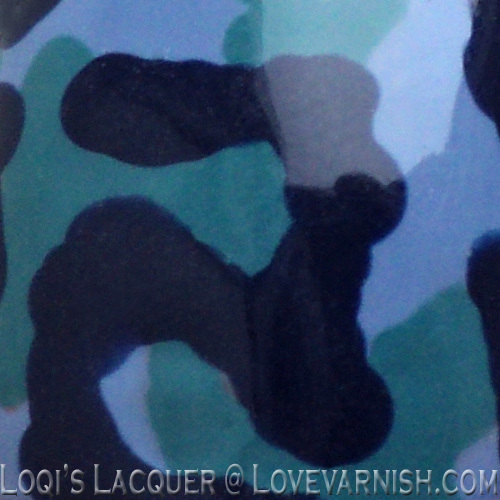 I was quite pleased with my own, but Loqi's is so awesome too! The patience she has to do a complete manicure freehand ♥. Yes this must be your favorite day in the challenge :D! Blue everywhere! Thank you Niky! You are making me blush!